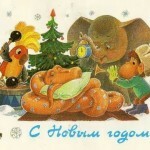 Vladimir Zarubin (1925-1996) was a Soviet painter, cartoonist (animator) and perhaps the best Soviet postcard master. 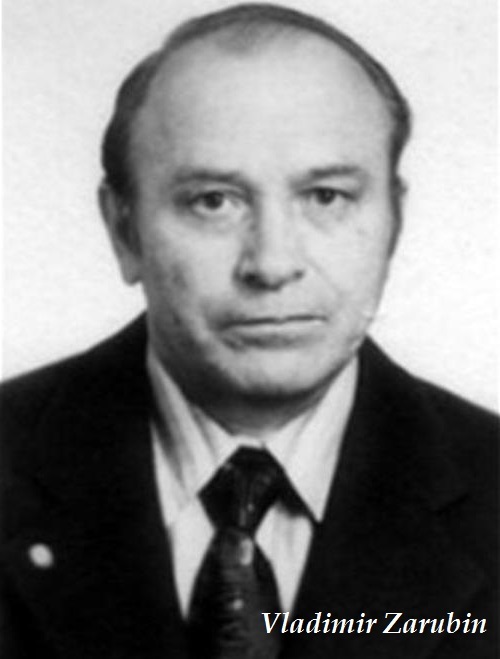 He was born on August 7, 1925 in the Andriyanovka village, Oryol region. 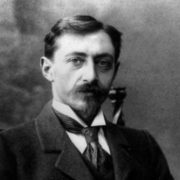 Vladimir took part in the Great Patriotic War. 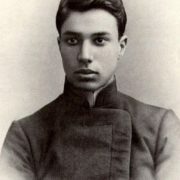 According to his son, the Germans occupied the town and Vladimir was moved to Germany, worked in a labor camp in Ruhr. Later he was liberated by the U.S. troops. After the war, from 1945 to 1949 Zarubin served as a gunner in the Soviet army. Since 1949, he began his career as an artist. First he worked in the Ministry of Coal Industry and from 1950 to 1958 at the factory. 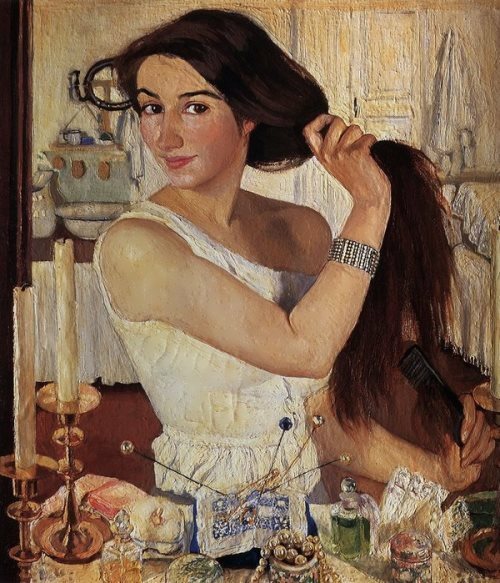 In 1958 he graduated from the Moscow evening secondary school. 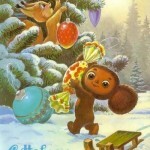 From 1957 to 1982 Zarubin worked as an animator in Soyuzmultfilm studio, where he had taken part in the creation of about a hundred drawing cartoons. In the late 1970s, Vladimir was admitted to the Union of Cinematographers of the USSR. Also Zarubin is known as a greeting card artist. In 2007 the catalog of his postcards was published. 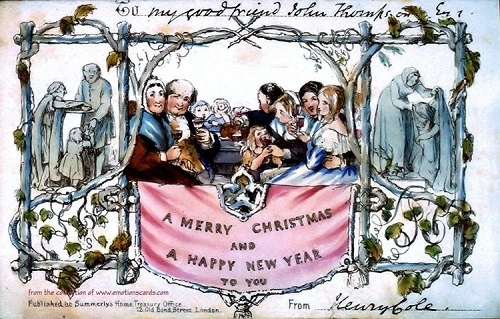 Sir Henry Cole was the first, who sent greeting cards to his friends on Christmas Eve in 1843. It became a custom and quickly spread throughout Europe and of course reached Russia. The card was an affordable but memorable gift. 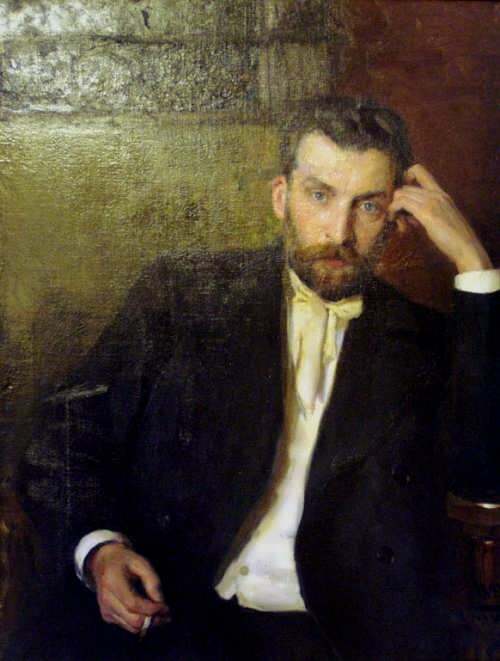 Drawings for postcards were created by the most famous Russian artists – Benois, Bakst, Makovsky and even Roerich. 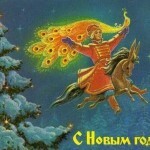 According to one version, the first New Year card was created by Russian painter Nikolay Karazin in 1901. 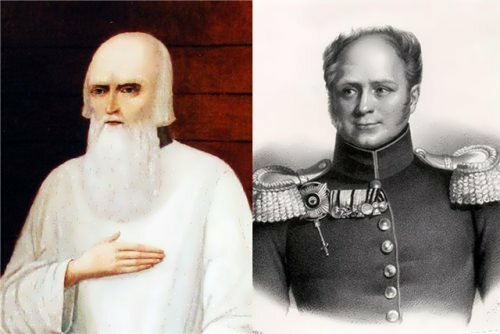 And according to another version, the “father” of Russian New Year’s card is Fyodor Bernshtam, librarian of the St. Petersburg Academy of Arts. Anyway, the Russian New Year cards were different from the European cards with biblical scenes and beautiful scenes with angelic babies on them. 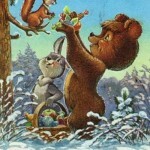 On Russian postcards you can see funny everyday scenes, landscapes, lovely animals. 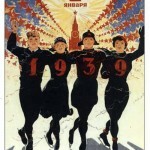 In the history of the Soviet New Year Cards October Revolution meant the appearance of censorship and a ban on any image of Christmas symbols. 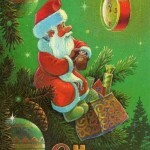 That’s why it’s hard to find Christmas cards, issued before 1939. 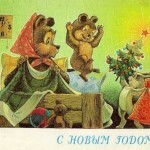 Before the Great Patriotic War on Soviet New Year cards can be seen mainly Kremlin chimes and stars. During the war, the role of cards had changed: they became a means to support the fighters. 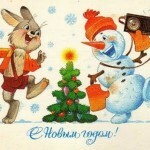 So there were cards with the words “New Year’s greetings to the heroic defenders of the homeland” and others. 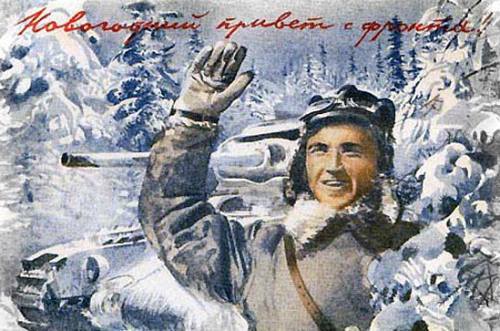 Those who waited received postcards with the words “New Year greetings from the front!”. 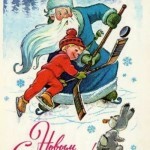 Despite the unusual interpretation of familiar stories (on New Year postcards of the WWII you can see Ded Moroz with a gun or with a broom sweeping out the Nazis, the Snow Maiden bandaging the wounded fighter) the essence of the cards remained the same – to support, to remember that you are loved and to present a smile. 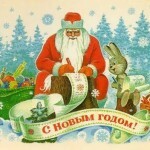 After the war, people had no money to spend on presents. So, postcards became popular again. They gave the opportunity to congratulate relatives in any corner of the country. In most families, cards were collected and then beautiful balls and boxes were made of them. 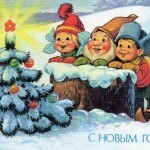 In the Soviet Union mass production of greeting cards was established in 1953. There were a lot of cards with images of fairy tale heroes, cars, trains, planes, space rockets, etc. In the 60-70s on postcards there were athletes celebrating New Year on the track or the rink, people in beautiful clothes sitting in a restaurant. On many postcards of that time you can see a “luxury” – TV sets, children’s mechanical toys, fruit, champagne. 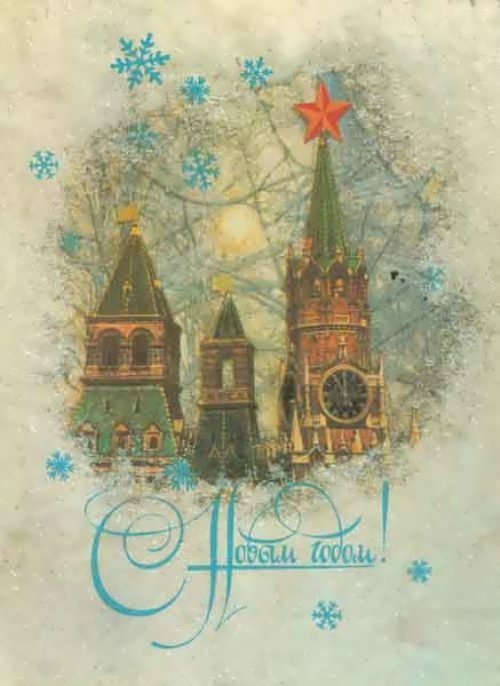 But the Kremlin stars, towers and chimes remained the most popular images of the Soviet New Year cards. In the 80s drawn postcards were displaced by photo cards with fir paws, shiny balloons, burning candles and winter landscapes on them. 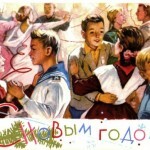 Despite all the changes many families still keep Soviet New Year cards, which are not only a piece of paper but sweet memories about relatives and childhood – the most beautiful time in everyone’s life. 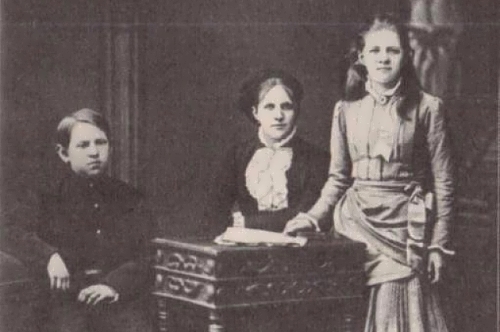 That’s why it’s nice to receive Soviet cards today, they are not just bright pictures with funny stories – they are part of the history of the country and of the family.